Satellite Beach: There’s Transparency And Then There Is Satellite Beach Transparency. A short, brief update on something that came to light that we had forgotten about. In the post below, we had embedded the YouTube video of the Satellite Beach City Council meeting of March 8, 2019. We embed a lot of videos and we cannot remember when we ever edited a video. We let the videos stand for themselves. In essence, what has happened is that Satellite Beach wants people to watch the video from their YouTube Channel rather than on another site. Instead of letting people see what happened, they want to control the access to the video. There is a reason for that. When you click on a video here from our site, Satellite Beach can’t see the IP address of who is clicking on it. When you click on it from their YouTube Channel, they can see the IP addresses of those who looked at the video. In short, Satellite Beach in all their proposed claims of transparency wants to know who is looking and watching. We have written to Satellite Beach and spoken to officials about this before and gotten no where. “Transparency” does not mean to Satellite Beach what it means to the rest of the world. No offense but being a geek I have to correct you on a bit of information you got wrong here. YouTube never exposes viewer IP addresses to creators. 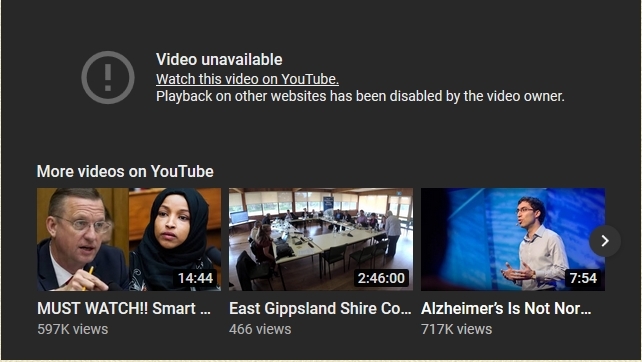 The city will not be able to see your IP address simply because you watched one of their videos on the YouTube website. They can, however, track your IP address when you visit the official city website. Anyway I just wanted to make sure you had the right understanding of the platforms involved here. Carry on.